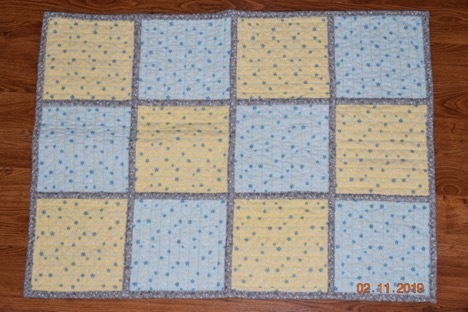 It’s hard to believe, but I finished the baby quilt I’ve been working on! Some of you may know that I’ve been working on a quilt for our new nephew (on the Larson side…don’t panic Werner relatives. Lol) And I got it done yesterday. Three whole days before our sweet little nephew is due to arrive. I used to quilt when Will and I were first married and I really enjoyed it. Then when the craziness of raising a family came along, I set that little hobby aside. But this winter, for some reason, I got he bug to quilt again. And thanks to You Tube, and Jenny at Missouri Star Quilt Company, I found a pattern and technique that I thought I could master so I tried it. And it worked! Now we can’t wait till Wednesday when we get to meet our sweet new nephew/cousin. Great job! It looks good! Great job. I didn’t know you were into that kind of stuff. It looks wonderful Bonnie!! Great job!! Very nice. He will love it.